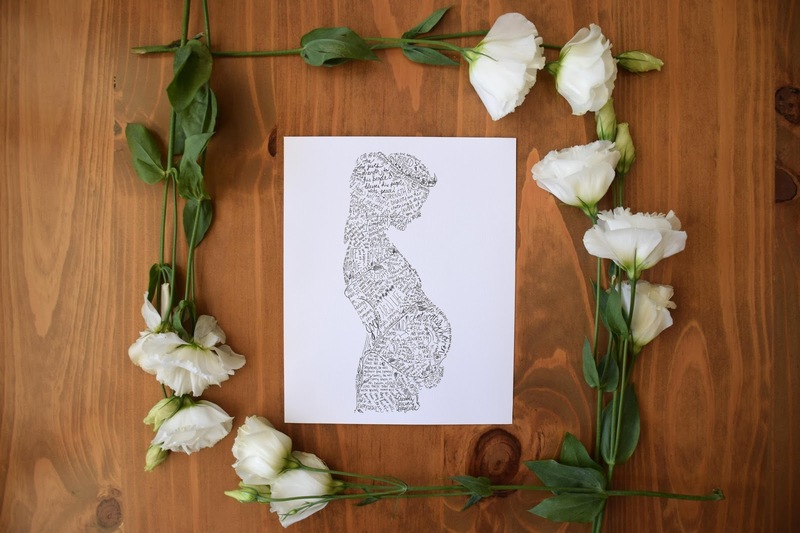 To go along with my new pregnant lady print I wanted to share Shepherd's birth story as it seemed fitting they go together. I had it typed up to post with the print blog but life is busy so I didn't get to finish it until now. I love reading birth stores and I know I am not the only one so I wanted to add mine to the millions that I am sure are all over the internet of life brand new. For this labour we decided on a home birth. We initially planned on having him in hospital but about half way through my pregnancy I had this growing subtle desire for a home birth. I tentatively brought it up with Jason one day while we were walking, unsure of whether he would go for it or not, and we then resolved to ask our midwife a million questions and pray about it. In the end we decided that as long as everything checked out healthy and baby was in a good position we would go for it. At 11:50 pm on October 13th, 2017 he was born, crying and perfect. Oct 12th- In the late afternoon I started having contractions. They just felt like very strong braxton hicks contractions mixed with a little pain. They were mild though so I could fairly easily ignore them. I had them all through the night and through the next day. Some woke me up in the night but mostly I slept through them and only some of the ones during the day made me stop and breath a little. I knew people had contractions like this off and on for sometimes weeks before actually giving birth so I didn't pay much attention to them. 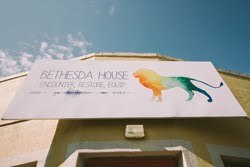 Oct 13th- It was a Friday which meant we had a Bethesda team meeting at our house. I was still having the contractions through our prayer time off and on and then left to lay down half way through the meeting because I was so tired from not sleeping well the night before. Sometimes they were like clock work 10 minutes apart and other times they were way more spread out. We went about our day fairly normally and I waited until the afternoon to message our midwife saying that I was having pretty consistent contractions but that I still didn't feel like I was in labour. It was more of a heads up that things were moving. 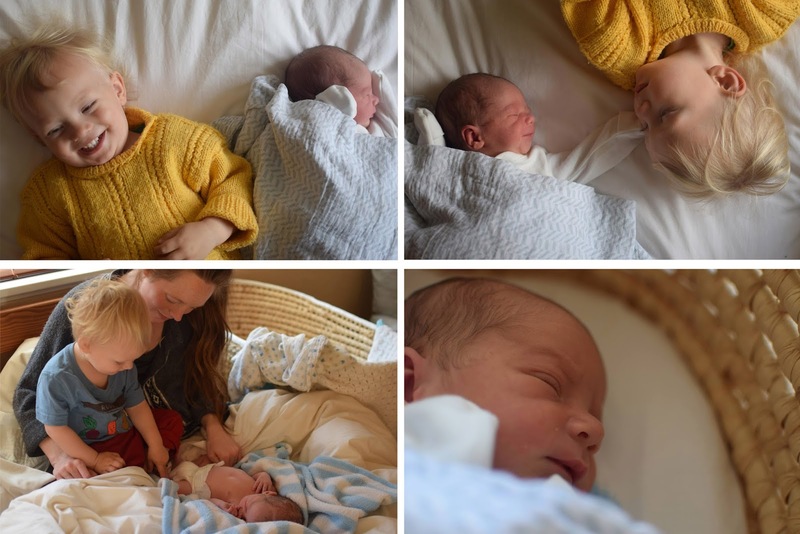 By evening they were beginning to get much stronger and were consistently 10 minutes apart so Jason put Ira to bed at 7 like his usual routine and we made sure everything was tidy and in place like we planned for the home birth. Everything was so normal up to this point that Ira had no idea what was going on which was really nice. He had no idea he'd wake up to his brother in the morning. Neither did we for that matter. All that day if I laid down or rested they tended to ease a bit and get further apart so I wasn't convinced I was really in labour yet. 8pm- I went to lay down because I was so tired and wanted to see what resting would do to the contractions. I was only going to lay until 8:30 but slept until 9 waking with each contraction every 10 minutes. By 9pm I had to start really concentrating through them and couldn't lay down and just breath anymore. I was also starting to shake a little bit during them if I got cold and thats when I knew that it was really starting. It was the first time I felt something similar to going into labour with Ira. I don't know about you but I need to be warm when I am giving birth or I get so tense. Heaters and hot water bottles and my water bottle with a bendy straw are essential. 10:21pm I messaged Sandy to come. Up until this point everything was intense but manageable. I was coping really well on my own and as much as it took all of my attention to focus through the pain I was doing really well. I was in my own little world and so focused. Then all of a sudden it shifted and the contractions got really intense and much closer together, I threw up and then realized I was likely a lot further along than I though I was. I could't wait for the midwife to arrive. I remember looking at the clock and praying to God that he would be born before midnight. I don't know why but I think I remember thinking that as hard as this was I felt I could definitely cope until midnight. 10:40pm She was here and had all her things set up. She had done a home visit a few weeks earlier to plan where everything would be and where she would put all her equipment so it was really smooth when she got here. I didn't have to worry about a thing and I just remember finishing a contraction when she arrived and looking over and smiling. She said, "you are doing great" and I was so thankful for her presence. Midwives are amazing. She checked the babies heartbeat and it was perfect. At this point I was on my knees leaning over our couch. On my hands and knees was the only position I could find any relief from the pain in between the contractions. Everything else hurt too much so I just stayed there the whole time breathing deep. Shortly after she checked me to see how dilated I was. I was already 8cm! Jason and I just looked at each other in disbelief. That was the best thing she could have told me. It took so long to dilate my first time that being so close to the end after what felt like such a short time was an amazing encouragement. I was like I can do this! At this point Jason had the shower all ready so I could sit with the warm water running on my belly but I ended up not needing it. He also messaged a friend to come over while I laboured incase Ira woke up but he never did. He slept perfectly through the whole thing! I actually sat on the toilet for a few contractions to have gravity help with the last 2cm. After about 3 contractions I threw up again and Sandy got me to move to our bed where she had set up a pile of pillows so I could lean on them and still labour in my hands and knees. She said very few things but when she did it was perfectly timed encouragement or direction and exactly what I needed to hear. She gave me the perfect amount of space while also being present. I felt very safe. She said the pressure would get intense soon and I would feel the need to push. Jason was right there giving me water when I asked for it and Sandy kept putting gentle pressure in my feet and legs that helped so much with the pain. Pretty soon I had to push. I would lean into those pillows and push with all my might. I don't remember how many contractions but it was very few and then I heard her say to Jason that on the next one he would come out. He did! 11:50pm Shepherd was born. He cried so loud and it was beautiful. She handed him to me between my legs as I was still on my knees and I got myself turned around so I could sit and snuggle my boy on my chest. That moment. It's my favourite. I would have kids over and over just to have that feeling of them seconds fresh resting on my chest. Oh. My. Goodness. It's my favourite. I remember saying, "he's so tiny!" and then looked at Jason in disbelief and said, "I am so glad we decided to do it at home!" I was in shock in every good way and just couldn't believe it. It probably seemed long for you reading this because it was a lot of writing but for me I only felt like I was in labour from 9pm so it was much quicker than I expected. Something I wanted to say is that I loved both of my births. I don't think one way is better than another. They were clearly different but I loved my hospital birth and I loved my home birth. I loved and needed the extra care and attention I received from my OB and nurses after I had my first baby. I needed it and would have struggled a lot more with the early postpartum days. I also loved having a baby at home. It made everything seem so natural and there was an ease to it that I don't think could be had at a hospital because of transferring and all of that. It was so familiar and smooth and going to sleep with my new baby in my own bed and then waking up to have big brother join us is what dreams are made of. Both were perfect. 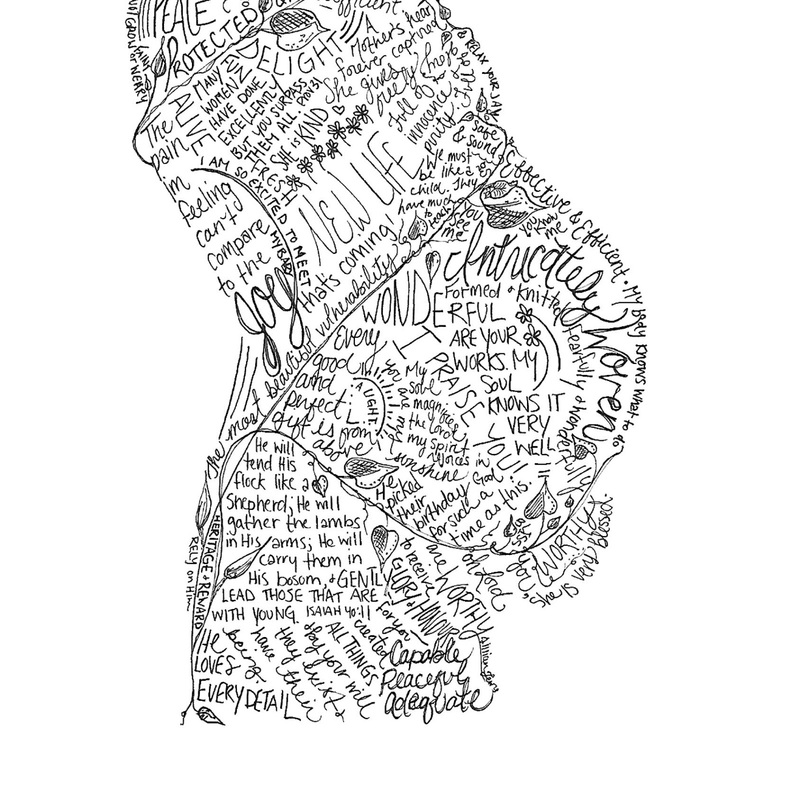 Since you made it all the way to the end here is a coupon code for the pregnant lady print! 20% off valid until March 15th 2018! 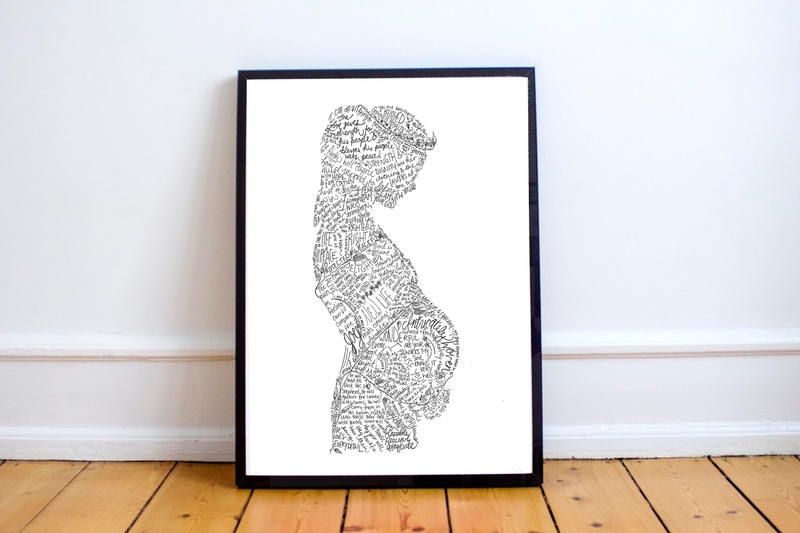 The pregnant woman print is probably my favourite one but that could be because it it very applicable to my life at the moment as I just had my second baby. 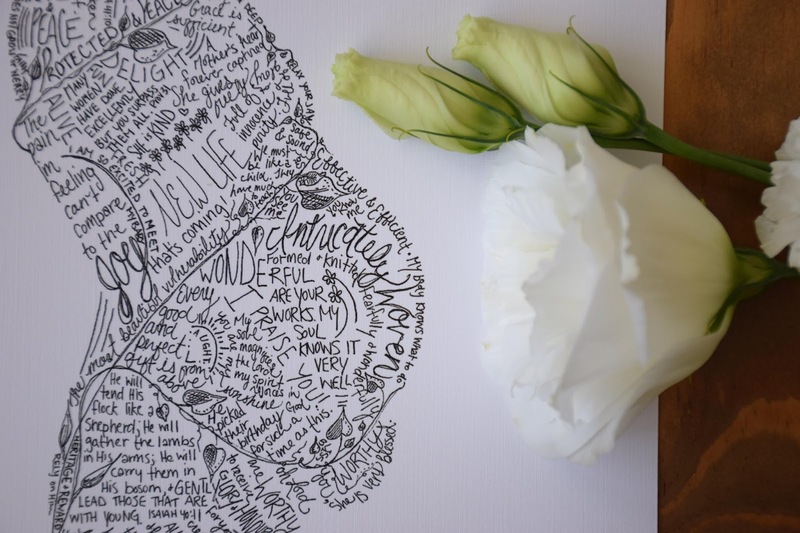 The original design for this print was one I did personally for myself as I meditated of the truths and scriptures I used as prep and encouragement for labour. I now have it hanging on the wall by my babies changing table and he looks at it every time I change his nappy. Since the one I did for myself was my own silhouette I figured I should better do one in a more generic mama shape so other women could use it as prep for labour too. It has a lot of scriptures that God showed me as I readied to have each child as well as birth affirmations and things I wanted to remember. I think the main scripture verse for me this time was Proverbs 31:25. Strength and dignity are her clothing and she laughs at the time to come. Birth is such a vulnerable time but not in the negative way the world views vulnerability. It is a beautiful vulnerability and in that God kept speaking to me that I am strong and dignified. I also love the detail of the subtle crown on her head. When I was creating mine God kept speaking to me that I was His royal daughter and I felt to wrap the vine around in the shape of a crown. I love it. I love creating with God because that was not a detail I would have thought of on my own but it is one of my favourite parts. If this print is for you or someone you know head over to my Etsy store HERE and get yourself a copy. It will be wrapped and sent from Cape Town with all the love.